For those who work in emergency health an average day is… well, average. But that same day for someone who has needed our service and care is unforgettable, with moments of shock, awe and gut-wrench; often, it’s one of the worst days of their lives. But for paramedics, emergency call takers and dispatchers, it’s just Tuesday. Or is it Wednesday..? Now, British Columbians are getting an up-close and personal view of what happens during the handling of real-life health emergencies before patients get to a hospital. BC’s educational public broadcaster, Knowledge Network, commissioned 10 one-hour episodes of a documentary series focused on the work of BC Emergency Health Services (BCEHS). BC Emergency Health Services (BCEHS) provides pre-hospital emergency services and inter-facility patient transfers throughout B.C. BCEHS handles 1700 emergency calls every single day. Vancouver-based Lark Productions accepted the challenge and started its eight-months of production in December 2017. This was not Lark Production’s first exposure to the lesser-known world of urgent and time-critical health crises. Lark produced two successful seasons of “Emergency Room: Life + Death at VGH”, a series that documented the emergency room at one of Vancouver’s busiest hospitals, Vancouver General Hospital. Many BCEHS paramedics were captured on that series, which prompted the idea for a TV-series solely focused on the world of paramedics and emergency call takers and dispatchers. After all, how many people truly understand the life cycle of a 911 call? The goal of the documentary series is to educate and inform British Columbians about emergency pre-hospital care from the perspective of those who work on the front lines. 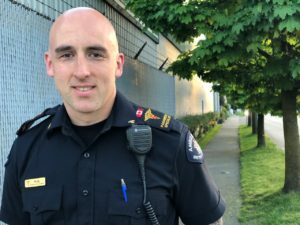 More than a year after cameras first started rolling in the Vancouver Dispatch Operations Centre and out on the streets of Vancouver and some of the neighbouring communities, the first episode of “Paramedics: Life on the Line” finally debuted on April 2 on Knowledge Network and is available online. Out of the 130+ filming days, production crews attended approximately 600 emergency calls in total. Throughout the process, nearly 500 BCEHS staff were filmed doing their work, however the production team focused in on a small, core group of paramedics to give viewers a closer, more personal view of the job. They followed these paramedics shift after shift, often for several blocks of shifts. 16-year primary care paramedic, Tara Williams, was one of those chosen for a more intimate experience. She said having people listening and watching her and her partner all the time took a bit of getting used to, but for her, the hardest part was having to speak about calls all the time (in the cases where patients and families agreed to filming). Tara hopes those explanations go a long way in helping to dispel misconceptions about what paramedics do. “This show is going to give the public a really good view of what we do – but also it’s an education. We’re not just a driving service, like some people think. We’re an emergency service trying to help a continuously growing and aging population. I think if the public knew of some of the emergencies we deal with on a day-to-day basis, they would think twice about using us as a taxi service. There are very serious things happening all the time,” added Tara. 18-year BCEHS paramedic Kris Erickson was another featured in this series. Kris agrees with Tara in the hope for improved public education. Kris is a BCEHS paramedic specialist. Paramedic specialists represent a small group of highly trained advanced care paramedics within BCEHS who are de-paired, responding in single-vehicle units and do shifts in dispatch in a clinical advisory role. As specialists are often working solo, it made the accompaniment of a production crew all the stranger for Kris. “You’ve got a bunch of people all crammed into a vehicle that’s really made for one, chasing down calls around the city. It was exciting but a little overwhelming at the start,” said Kris. Seamless, but a wide scale production such as this did have an impact on staff. But the impact wasn’t in the way one might assume. According to Kris, it was the mundane everyday tasks that caused the most consternation. “Some of the most challenging times were going to get something to eat, or when to take your washroom breaks – because you’re constantly mic’d up and being watched. Those (filming days) were some of the most fatiguing days of my career… You know, over the course of a ‘normal’ day you get downtime, quiet time, alone time to reflect – here, I was always reflecting on a microphone,” said Kris. Although respecting patient privacy was initially thought to be this project’s biggest challenge, paramedics Kris and Tara both agreed that aspect went more smoothly than expected. A filming agreement outlining clear no-go zones became the guiding authority throughout filming. BCEHS also dedicated a full-time staff liaison to oversee adherence to the agreement. “I would say patient privacy was handled well, almost too well, if I could say so. If there was any question about the patient’s mental state or if one family member was saying yes but another wasn’t sure, respect was paid and privacy was kept intact. There were no questions asked. The crew backed off immediately and we would continue to do our work as though they weren’t even there,” explained Tara. Patient care and wait times were never affected by this production. All production staff involved were given training in scene safety as well as privacy and patient confidentiality. Also, an Advisory Committee was established to ensure the portrayal of BCEHS staff, patients and the extended community was ethical and respectful of privacy. It seems the production crew’s past experience shooting in a bustling, unpredictable emergency room contributed to their adaptability in the pre-hospital environment. Another group the production team focused on for the series was BCEHS dispatch operations. Peyman Namshirin is a dispatch supervisor at the BCEHS Vancouver Dispatch Operations Centre. He’s been with the service for 22 years. He recalls the initial days with the documentary crew required some adjustment. “It definitely brought a different element to our environment with the cameras, the lighting, the microphones… but I don’t think it really distracted us from our work,” added Peyman. Peyman said he is personally hoping the series results in a better appreciation of dispatch operations by his colleagues on the street. For Tara and Kris, they too consider what their peers will think. Despite the challenging logistics for integrating this filming crew into one of the dispatch centres and out on the streets, those involved say they wouldn’t hesitate to do it all over again. “I’d absolutely do it again. We don’t do this (job) for recognition but that’s definitely a subject that keeps coming up – a desire for greater understanding of what we do in a day. 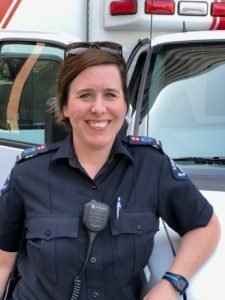 Every once in a while, everyone needs a little recognition – an acknowledgement that you’re providing a beneficial service… because I don’t think anyone gets into paramedicine for the money,” laughed Kris.